Sovereign Office hosted the Mayor of Dudley this week when he visited the dealer’s head office in Halesowen. 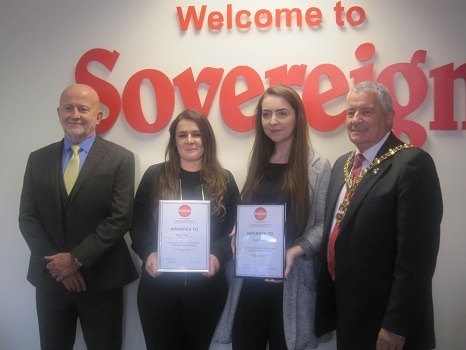 Sovereign is well known for its support of apprenticeship schemes, and today’s visit was to meet MD Gary Cox and other staff in acknowledgement of the company’s contribution in helping train and develop workplace skills. During the visit he met with customer service apprentices Niambh Bodman and Dannon Billingham and was pleased, on behalf of the company, to award them permanent staff status, thus successfully completing their apprenticeship.